Isn’t it time you gave yourself a break and took some time to feel appreciated? Roots Canada is answering that need by throwing one of the biggest events of the year. For a limited time, you can save 25% off your entire order. Did you know that our Roots Canada page has started the savings early and you can receive free shipping with no required minimum purchase? Let me know below if you’re as excited by this as I am! As a side-note: whereas the sale ends soon, the free shipping offer will remain valid until the 30th of November. Be sure to also check out Roots’ new section “Gifts for Her/Him” with a wide selection of items for both. I was just talking to my awesome coworkers about how I could definitely use a pair of gloves that will work with my touchscreen devices. 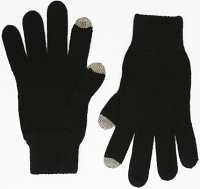 Thanks to this deal, I will gladly pick up a pair of these women’s gloves so that I can fiddle with my iPod in the cold. With this amazing deal, they come out to only $27. Don’t miss out on their biggest sale. What was the last thing you purchased from Roots?